We hope you enjoy this simple craft idea from Family Fun magazine, just in time for spring cleaning! 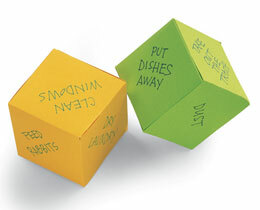 Household chores can be a bore, so add some excitement to the work with homemade dice designed just for your family's cleanup duties. 1. To make each cube, transfer the pattern shown here onto stiff paper or card stock (or you can print a template). 2. Next, write one household chore in each square. For extra fun, you can also label some of the squares "Free" (for a day off), "Choice" (to let players pick their own jobs), or "Trade" (to let the roller swap one task for a job belonging to another family member). 3. Cut out the shape and fold along the dotted lines. Dot the tabs with glue and form the paper into a cube, pressing together the tabs and faces to secure them in place. Let the glue dry. Repeat with more cubes for more tasks, if needed. 4. On your next chore day, take turns tossing the dice until all the jobs have been assigned.